An herbicide has a specific site (target site of action) where it acts to disrupt a particular plant process or function (mode of action). If this target site is somewhat altered, the herbicide no longer binds to the site of action and is unable to exert its phytotoxic effect. 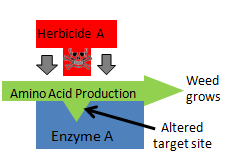 This is the most common mechanism of herbicide resistance. 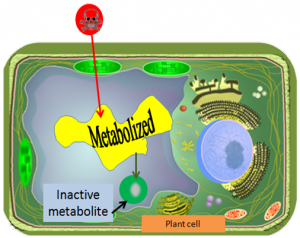 Metabolism within the plant is one mechanism a plant uses to detoxify a foreign compound such as an herbicide. A weed with the ability to quickly degrade an herbicide can potentially inactivate it before it can reach its site of action within the plant. 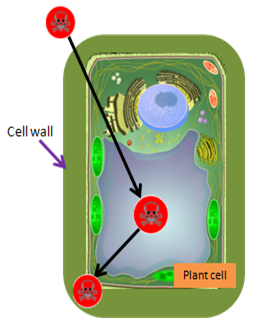 Some plants are capable of restricting the movement of foreign compounds (herbicides) within their cells or tissues to prevent the compounds from causing harmful effects. 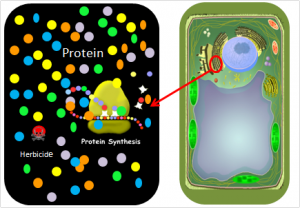 In this case, an herbicide may be inactivated either through binding (such as to a plant sugar molecule) or removed from metabolically active regions of the cell to inactive regions, the cell wall, for example, where it exerts no effect. If the target protein, on which the herbicide acts, can be produced in large quantities by the plant, then the effect of the herbicide becomes insignificant.